Frankfurt Airport, situated in Frankfurt’s Flughafen district, is the gateway to the entire world. Originating as a commercial airport in 1936, it functioned as a military airbase during World War II, before resuming its commercial function to this day. Today, Frankfurt Airport serves 293 destinations, making it the airport with the most direct routes in the world! Frankfurt Airport (IATA code: FRA) is the busiest airport in Germany and the hub for Lufthansa. Flights to Frankfurt Airport are provided by international airlines such as South African Airways, Emirates and British Airways. FRA is a 20-minute drive from the city centre of Frankfurt. Book your cheap flights to and from Frankfurt Airport online! Frankfurt Airport is one of the oldest airports of Europe and the busiest in Germany, and the home of the Star Alliance. Serving a long roster of airlines from around the world, it’s no surprise that this airport receives nearly 65 million passengers per year through its two immense terminals. At Frankfurt Airport, you can immerse yourself into the culture of Germany with events like the Oktoberfest festival. Get breath-taking sights with the airport’s incredible Entertainment Gate, a huge LED video wall showcasing what goes on at Frankfurt Airport. Compare and book cheap flights to and from Frankfurt Airport with Lufthansa. Frankfurt Airport offers everything you could need for your trip to the city of Frankfurt. The variety of shops where you can treat yourself to some retail therapy include products such as foods, fashion, jewellery, entertainment, electronics, flowers, as well as duty-free goods. Make sure to adhere to the baggage restrictions at your airport. For any minor health concerns, Frankfurt Airport includes a number of pharmacies. You will definitely be hungry after exploring the wide array of retail outlets at Frankfurt Airport. Rest your feet and replenish your energy with a choice of meal options at the various eateries at the airport, including restaurants, takeaways, cafés and bars. The lounges at Frankfurt Airport are reserved for business class travellers and passengers with special privileges. 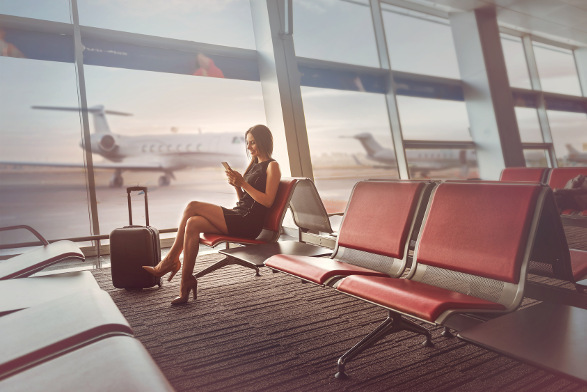 These comfortable spaces are operated by various airline companies, including Air Canada, Air France KLM, Cathay Pacific, Etihad, Iberia, Japan Airlines and Lufthansa. Other features and facilities at the airport include free Wi-Fi, luggage storage, information desks, passenger support services, medical facilities, porter assistance, currency exchange facilities, movie rooms, yoga rooms, workbenches, a quiet room, a gaming area, smoking lounges, leisure zones, playgrounds, baby rooms as well as prayer rooms. Hilton Garden Inn Frankfurt Airport This modern 3-star family hotel is situated to the immediate north of Frankfurt Airport. It includes amenities such as breakfast, a 24-hour fitness centre, a 24-hour business centre, childcare, air conditioning, a restaurant and a bar/lounge. Free Wi-Fi is also available. Hilton Frankfurt Airport This magnificent 4.5-star hotel sits immediately to the north of the airport. Amenities available at this establishment include a 24-hour fitness centre, a 24-hour business centre, childcare, air conditioning, a laundry service, a restaurant and a bar/lounge. Free Wi-Fi is available in the lobby. Sheraton Frankfurt Airport Hotel & Conference Centre This huge 5-star luxury hotel is situated by Terminal 1. Its many amenities consist of breakfast, a fitness centre, massage/treatment rooms, a 24-hour business centre, a 24-hour front desk, child care, coffee/tea in a common area as well as 2 restaurants. Free Wi-Fi is available in the lobby and guests have the convenience of a free airport shuttle. Foreign exchange needs to be ordered within 60 days in advance of the collection date. You can only collect the order in person as orders can only be collected by the person named on the order form. Deutsche Bank, Commerzbank, Reisebank, International Currency Exchange, Travelex, as well as many ATMS are available between levels 0 and 4 of Terminals 1 and 2 at Frankfurt Airport. Parking options available at Frankfurt Airport include short-term and long-term parking. A complimentary shuttle service is available to transport you from the car park to the terminals. You can reserve your parking space online. Frankfurt Airport is 12km southwest of Frankfurt’s city centre. Trains, buses, Uber and car rental options are available to get you from the airport to your destination.